On Monday night, Kansas brushed Texas aside to clinch another outright Big 12 title, send seniors Devonte’ Graham and Svi Mykhailiuk out with a bang, and stay ahead of the pack in the chase for a #1 seed in the NCAA Tournament. Around the college basketball landscape, many keystrokes have been dedicated to the historic and dominant nature of Kansas’ seemingly eternal grip on the Big 12, but while the 14-year streak is all those things and more, many Jayhawk fans would trade one or two of those regular season crowns for another Final Four run (Bill Self‘s two appearances were in 2008 and 2012). With the way his team is playing as March quickly approaches, however, this year may not be an either/or proposition. The biggest reason why the Jayhawks are peaking has been because of Graham’s outstanding recent play. He’s been terrific all season but is clicking on all cylinders right now, with averages of 18.6 points and 6.9 assists per game over his last nine contests. Additionally, he’s drilling 44 percent of his three-point attempts and taking care of the ball with just 2.5 turnovers per 40 minutes over that span, all while playing virtually every second of competitive games. For Kansas to reach San Antonio, Graham needs to remain on his game in March and not disappear like he did in last season’s Elite Eight loss. The good news is that it’s been nearly three months since the senior put up a dud. As long as he continues to be a linchpin of the Jayhawks’ attack, it’s going to be increasingly tough to think he’ll go AWOL when the team needs him the most. Furthermore, the interior presence of sophomore center Udoka Azubuike also gives Kansas a dimension it didn’t have last March. One of Self’s biggest accomplishments last season was squeezing every available ounce of production out of Landen Lucas, but Azubuike is a bigger, more reliable target down low, a stronger defensive force and slightly less foul-prone than his predecessor (4.8 whistles per 40 minutes, compared to Lucas’ 5.2 in 2016-17). The Jayhawks have also shown increased confidence in their ability to hold things together when Azubuike gets in foul trouble or needs a breather. Conversely, Kansas was forced to play an overmatched Mitch Lightfoot behind Lucas last season, but Lightfoot is better suited for a supporting role this season, exhibiting excellent defensive timing and a stronger understanding of what he needs to contribute on offense. 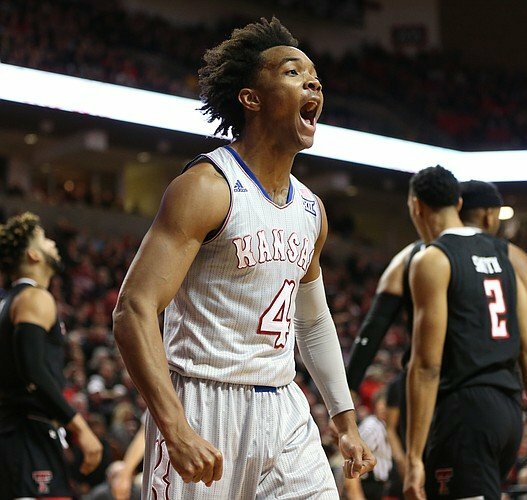 Kansas, like every other team in college basketball this season, still has some weak spots, but the Jayhawks’ recent play as we turn the corner into another exciting March should make them a popular pick to cut down the nets in San Antonio. This entry was posted on Tuesday, February 27th, 2018 at 2:01 pm by Brian Goodman	and is filed under big 12, feature, microsites. Tagged: bill self, Devonte Graham, kansas, Mitch Lightfoot, udoka azubuike. You can follow any responses to this entry through the RSS 2.0 feed. You can leave a response, or trackback from your own site.